After a droolworthy announcement last year, Intel has finally taken wraps off its much hyped Intel-AMD MCM. The MCM is available in 65W and 100W total package power and will soon start showing up in notebooks and NUCs this year. When Intel announced its collaboration with AMD's Radeon Technologies Group last year, everyone thought the impossible was happening. 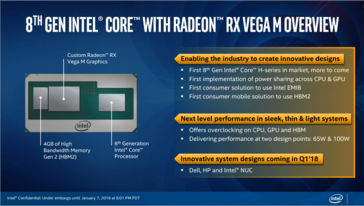 Intel could successfully create a multi-chip module (MCM) by coupling an 8th generation CPU with a Radeon Vega GPU with HBM2 memory. All three components are interconnected by the EMIB bridge. The press and consumers alike were pretty excited about the possibilities of such a collaboration and have been clamoring for more. Although we've had a few leaks about the chips in the past few days, Intel is now bringing a lot more information to the table in the wake of CES 2018. Let's check it out without further ado. The new die package with the Radeon Vega graphics belongs to the G-series in the 8th generation processor lineup. Now, we have the U-series chips on one end, which are aimed at mainstream performance with long battery life and the H-series chips on the other, which are geared towards mobile enthusiasts. The G-series sits right in the middle of both these extremes and offers all the might of the H-series along with a discrete GPU on the same package facilitated by the EMIB interconnect. This paves the way for thin and light notebooks, which excel at gaming and content creation. The new MCM boasts a lot of firsts — for one, it is the first of the H-series chips to hit the market and more importantly, it is the first consumer-grade implementation of the EMIB technology. The package offers overclocking abilities on all three components viz. the CPU, GPU, and the HBM2 memory and comes in two total package power variants of 65W and 100W. We will look at power sharing in the package shortly. The EMIB facilitates 8 lanes of PCIe 3.0 connectivity between the CPU and the GPU with the CPU retaining the remaining PCIe lanes for peripheral connectivity. The HBM2 VRAM in the MCM is the first of its kind mobile implementation and serves to provide the needed power efficiency without sacrificing bandwidth. It is also interesting to see that the whole package is just 1.7 mm thick. 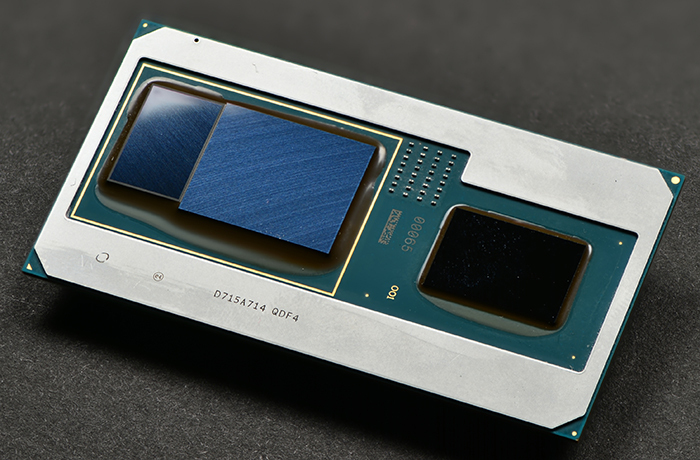 While the CPU is a pretty capable H-series chip, all eyes were on the Radeon Vega M GPU that was part of the package. The Radeon Vega M GPU is, for all intents and purposes, a discrete GPU. The CPU has an integrated Intel UHD Graphics 630 for low graphics workloads and will dynamically switch over to the Vega M for any GPU-intensive task. The Vega M, specifically the GH variant, has 24 compute units, up to 16 render back ends, can push 64 pixels per clock, and can support up to 6 displays. It is DisplayPort 1.4 and HDMI 2.0b compatible and can encode/decode 4K60 video. The integrated Intel GPU can support up to 3 displays and brings native support for Intel Quick Sync video. The Radeon Vega M is supplemented with a power-efficient 4 GB HBM2 memory sporting a 1024-bit bus. 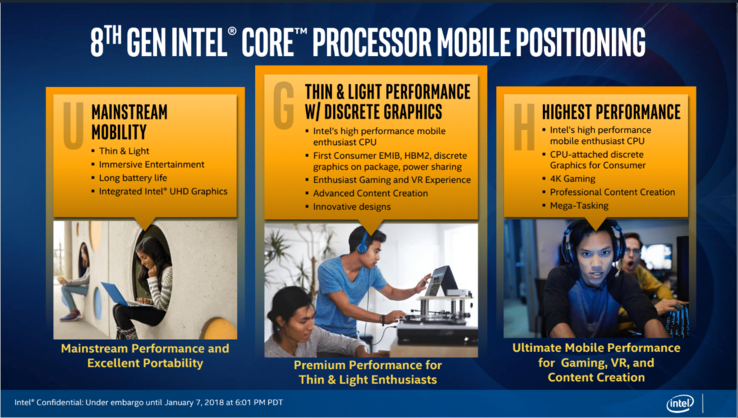 When news of the Intel Core i7-8809G leaked last week, people could not correlate how a 100W, or even a 65W, TDP could possibly find its way in notebooks and ultrabooks. We now have some information on how Intel plans to possibly implement this. The keyword here is 'total package power'. 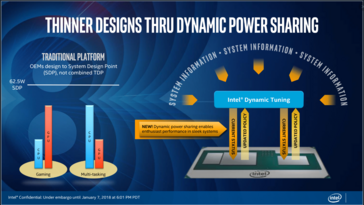 The Intel Dynamic Tuning software framework will intelligently share power between the CPU and the GPU depending on the workload. 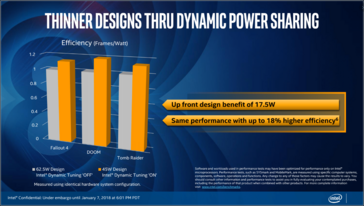 Intel showed off some metrics wherein the MCM design had an upfront power benefit of 17.5W while still offering higher efficiency compared to an independent 45W design. 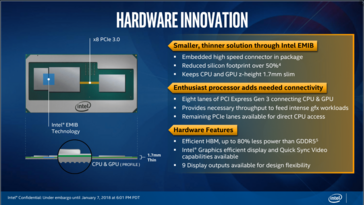 Intel has a range of processors linedup for the 8th generation G-series. 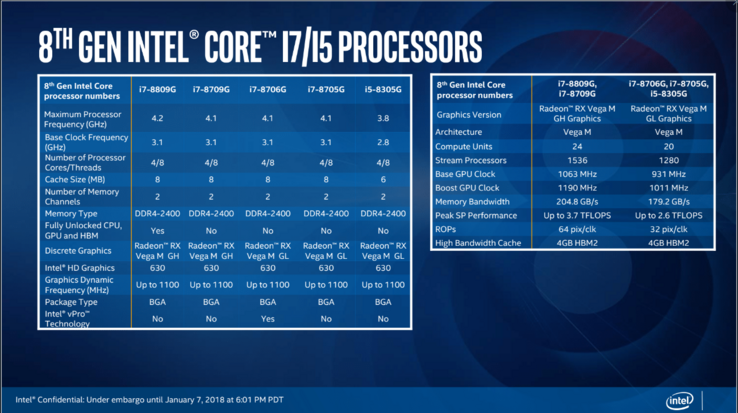 The highest SKU will be the Intel Core i7-8809G, followed by the i7-8790G, i7-8706G, i7-8705G, and finally ends with the low end Core i5-8350G. All the i7s operate at a base clock of 3.1 GHz and can turbo boost up to 4.2 GHz. The i5-8350G has a base clock of 2.8 GHz and a turbo clock of 3.8 GHz. All CPUs are 4C/8T and support dual-channel DDR4-2400 MHz memory. The Vega M component comes in two flavors — the i7-8809G and the i7-8709G sport the Radeon RX Vega M GH graphics while the rest feature the Vega M GL variant. The GH variant has 24 compute units with 1536 stream processors and a memory bandwidth of 204.8 Gbps while the GL variant has 20 compute units with 1280 stream processors and a memory bandwidth of 179.2 Gbps. The GL variant operates at reduced clocks (931 MHz base; 1011 MHz turbo) than the GH variant (1063 MHz base; 1190 MHz turbo). Both variants feature 4 GB HBM2 VRAM. 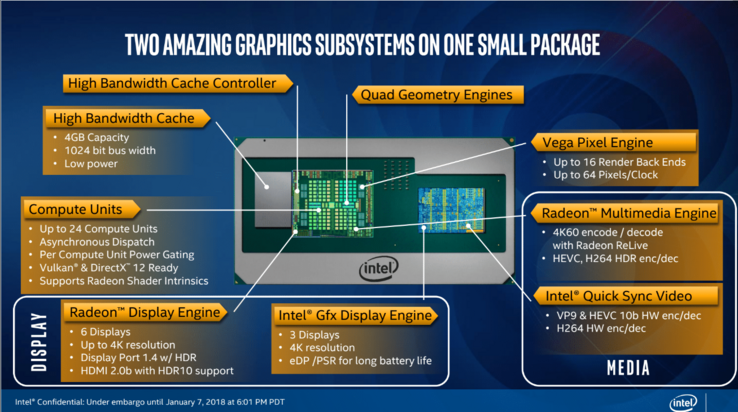 Although the package features a custom AMD chip, all support with respect to these processors will be provided directly by Intel. 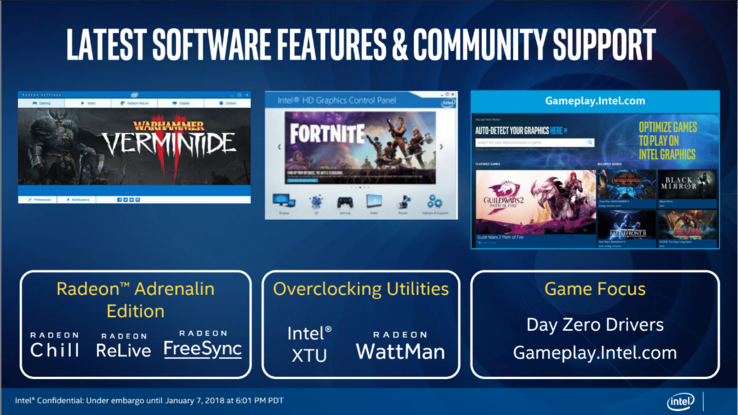 That includes providing day zero driver support for the latest games along with releasing new versions of the Radeon Adrenaline Edition software (notice that the UI will be in blue unlike the traditional red) that includes Radeon Chill, Radeon ReLive, and Radeon FreeSync. Intel also said that overclocking utilities such as Intel XTU and Radeon WattMan are fully supported. The advent of the Intel 8th generation G-series CPUs with Radeon Vega M graphics couldn't have come at a better time. This package provides the perfect platform for OEMs to offer thin and light notebooks that deliver high-end gaming and content creation capabilities. HP and Dell are already onboard and will soon announce their offerings during CES. We expect other OEMs to follow suit as well so stay tuned to Notebookcheck as we bring all the action from the most anticipated tech show of the year.